Our mission is to create an esthetically pleasing landscape while protecting the quality of the environment. Developing and maintaining the integrity of this landscape will enhance the value of our subdivision. Thank you to the team of volunteers who worked so hard on these major projects! In particular, everyone would like to thank Vicki Steh for her drive and determination to complete such a large project over the last two years. Thank you Vicki! A common area along Mountain View was re-landscaped this season. The team focus for this season (and the next 2018 season) was the re-painting of all utility boxes in our HOA. A sample few were done with various coats of paint on each one to test their resilience during the summer heat and monsoons. During the 2018 winter season, all boxes will then be painted. Work around a mailbox area on Calle Madrid will also be completed. Now that our Camino del Sol area is completed and thriving we focused on other common areas inside our HOA during the 2015-2016 Winter season. What can a small team accomplish? We started work early in January 2016, on the common area alongside 3131 S Calle Madrid. With little rock, a few plants and hard work from our hardy volunteers, the picture below tells the story. A big thank you to all the helpers who worked so hard; in particular to Jack King, who spent his birthday morning beautifying our neighborhood. The Focus for the 2014 and 2015 season was to completely revamp the large common area that runs along Camino Del Sol. Many of our members worked during the two seasons. The Photos link at the top of the Home page as many pictures of some of you. Monday, March 30, 2015 was the last big work day for this extensive project. 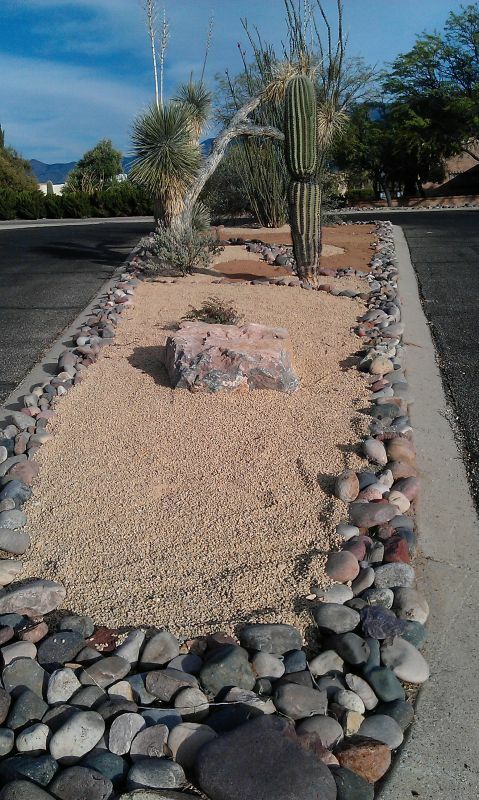 There were already mature plants in this area and the plan was to create accent areas with the existing material and then to spread the same colored rock that was used so successfully in the southern area. Reminder of our Mission: To create an anesthetically pleasing landscape while protecting the quality of the environment. Developing and maintaining the integrity of this landscape will enhance the value of our subdivision. You will find many pictures in our 'Photos' link on the Home Page, a whole album full. And so, we started the major project for 2014......see the Outline Plan below. After the watering volunteers kept the new plants healthy over the summer months, we are all returned in the fall to a beautifully landscaped common area which still receives lots of comments from those passing by. In addition, the Island area in Placita Seville was done too. 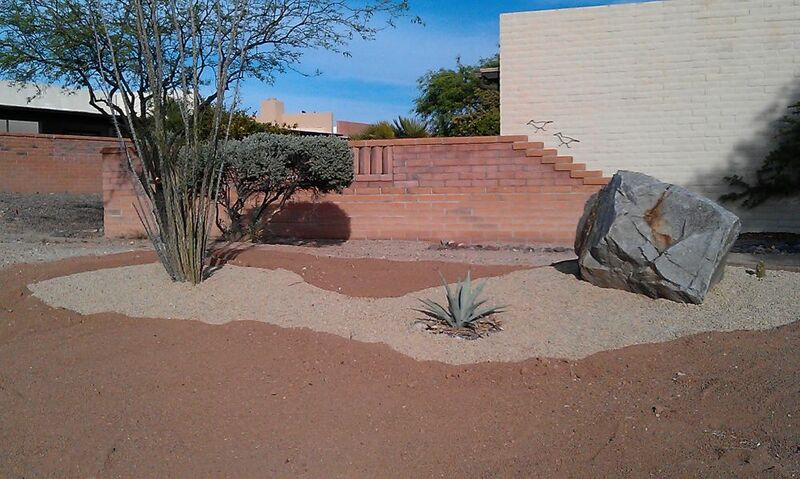 The key project for 2014 was the improvement of our very large South Common Area along Camino del Sol. The outline plan was discussed at the Annual Dinner and was presented at the AGM on February 22, 2014, as well. Everyone was excited and many volunteers came forward, offering time, money and encouragement. Good News - Over $2,000 was raised for this key project - thanks to all of our supporters in January and February! More than 100 ton of rock was required (at a cost of $3-5000). In addition, new plants were planned as per the outline below. The Board even opened a separate account for this project.